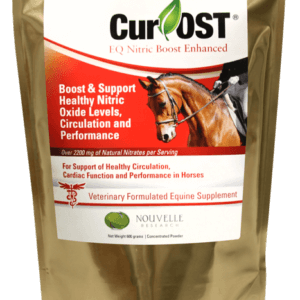 Cur-OST EQ Pure Critical Care Formula targets joint, tendon, muscle and foot problems associated with high levels of inflammation. Potent levels of Curcumin 95% , Turmeric Oleoresin extract, and Boswellia with supportive antioxidants in a Flax seed base. Targets Critical Levels Of Inflammation & Discomfort in Horses with a Variety of Conditions! Our most popular formula for intense health and lameness conditions! Cur-OST EQ Pure targets joint, tendon, muscle and foot problems that are associated with high levels of inflammation in the body. 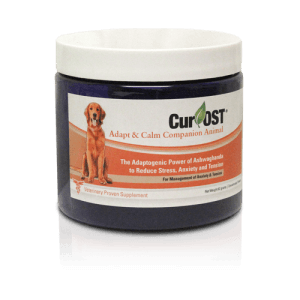 Our most potent formula with the highest levels of Curcumin 95% extract, Turmeric Oleoresin extract with volatile oils and natural curcuminoids combined with Boswellia 65% extract to target those horses in need with critical conditions. Powerful levels of Vitamin C and CoQ10 to combat oxidative stress with Flax seed for Omega 3 fatty acids. High levels of discomfort associated with joint conditions? High levels of discomfort associated with tendon conditions? High levels of discomfort associated with laminitis or navicular conditions? Potent levels of Curcumin, Turmeric Oleoresin extract and Boswellia to strongly promote a healthy inflammation response in the lame horse. Down regulates key enzyme pathways involved in the inflammation process. Vital antioxidants to provide high levels of cellular health and repair. FACT: Horses with debilitating injuries, various medical conditions and severe joint deterioration are often dependent on high doses of prescription anti-inflammatories to maintain quality of life. SOLUTION: Manage the high levels of uncontrolled inflammation more completely, improve function, mobility and quality of life without side effects. Curcumin has been demonstrated in research to promote a healthy inflammation response more completely than traditional therapies, by blocking key enzyme pathways that contribute to the release of many inflammatory proteins that are involved in immune compromise and tissue degeneration. By combining higher levels of Curcumin, Turmeric oleoresin extract, Boswellia and potent antioxidants, we are able to provide critical support to improve overall health. Through The Research Proven Power Of Curcumin. Manage Chronic Inflammation at its source and health, soundness and vitality can be RESTORED. Our Cur-OST EQ Pure formula provides potent levels of Curcumin to target critical levels of inflammation while providing potent antioxidants to aid in cellular repair and function. Ideal for those horses dependent on prescription anti-inflammatories just to maintain quality of life. Manages inflammation associated with joint conditions, muscle disorders,laminitis or navicular syndrome. If you manage inflammation properly, there is no need for glucosamine or chondroitin type of products! Cur-OST formulas are designed to reduce inflammation through the use of Curcumin and other anti-inflammatory herbs.Inflammation is an ongoing problem associated with not only joint deterioration but also many other health conditions.Most joint supplements contain glucosamine & chondroitin, which mainly target cartilage repair by providing nutrients lost as a result of chronic inflammation. Curcumin is the active phytochemical in Turmeric (Curcumin longa).The root of the Turmeric plant is the main plant component utilized and contains many beneficial ingredients with medicinal value, but Curcumin is by far the most active.Most supplements utilize Turmeric, but Turmeric only contains 2-4% Curcumin on average and honestly, Curcumin is what we are looking for to benefit health.By using Curcumin, instead of Turmeric, we can reduce our daily dosage and in most cases, obtain much higher health benefits.There has been much discussion about the absorption and bioavailability of Curcumin in human studies, but our research has not shown this to be an issue.We utilize a patented Curcumin product called BCM-95, which combines the 95% Curcumin extract with volatile oils from the Turmeric root and based on research studies, this enhances absorption by up to 7x! BCM-95 Curcumin has also been shown to be more potent than Curcumin with added bioperine, demonstrating higher and more sustained blood levels. Curcumin is fat soluble, so the addition of these natural oils makes sense and simply works better than traditional Curcumin or Turmeric blends. 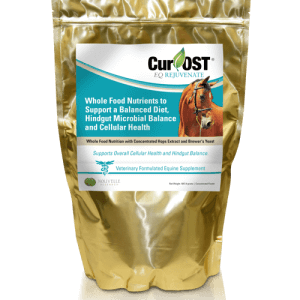 Our Cur-OST formulas provide potent levels of herbs and nutrients that often mimick levels found in human and animal reserach studies, to produce results clinically for your horse. After all, that is what you are looking for and we understand this. 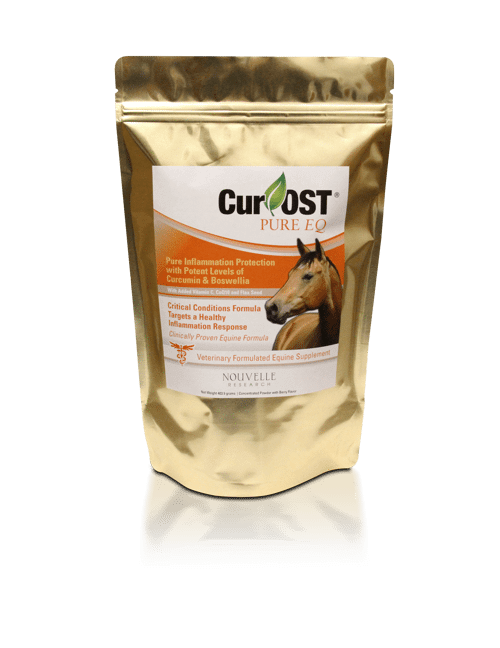 Cur-OST formulas are the only supplements on the market using potent levels of patented BCM-95 curcumin in combination with other critical anti-inflammatory herbs.We don’t just want to provide a product with trace or non-functional levels of a particular ingredient, but we want to provide levels that actually make a difference for your horse. Health is expensive, but we find that with continued use of Cur-OST formulas, many other traditional supplements can be discontinued, which saves you money in the long run and actually yields better results clinically. The goal with equine recovery is to find the formula or combination that helps to produce results, then over the next 6 months, try to reduce the dosage needed or move down to a lesser strength formula that provides similar results. Often we find that down grading formulas is possible once the initial health problem is under control, which again helps to save you money. If we can restore health on many levels, then the overall cost to you as an owner is reduced as hopefully your horse is healthier, stronger and sounder, which requires less visits from the doctor! That is our goal…to restore health! In the Cur-OST research trials conducted at our hospital, we have encountered no negative side effects even at extremely high dosages. We have monitored general health, complete blood chemistry panels as well as cytological parameters in all patients. There have been no negative side effects or alterations in blood panels noted throughout the trial. Cur-OST formulas have been used in patients for over 7 years with no side effects noted.In some instances, there have been reported hypersensitivities to various ingredients, but it is a rarity and not uncommon with any supplement.Based on human research trials, there have been no negative side effects noted in trials up to 3 years in length and at extremely high dosages. Cur-OST has not been evaluated in pregnant animals or animals that are currently lactating. Our Cur-OST equine formulas do not contain any substances on the banned FEI or USEF list.All ingredients in the products are listed accordingly on our labels.Nothing more and nothing less.Please consult the rule book of your show organization for specifics on illegal substances. Perfect addition on race days to the Total formula for my arthritic allergy horse. Works great without risk of NSAIDS. Absolutely love this product! My arthritic mare turned into a young horse again! She has a calmer look in her eye and she is more enjoyable to ride without using prescription polyglycan! Yes, polyglycan worked for a little while but it didn’t last long and she still was dealing with pain. Thank you so much to Nouvelle research for great products that are natural for the horses! I use curcumin also for my pain. I believe in this stuff! Love love love!!!! Thank you Nouvelle research! My barrel horse is running better than before on your product! Great product! I have a filly that had sarcoids. I began giving the Cur-OST Pure a week before starting the Xterra treatment. The vet told me to apply the Xterra once daily for seven days and the sarcoid was going to get really nasty and possibly painful, wait seven days, and apply the Xterra another seven days. After the fourth treatment the sarcoid fell off. It never got nasty or painful and I believe it is because the Cur-OST Pure helped her immune system fight off the sarcoid. I have also noticed a change in her overall health in just two weeks. Her coat is darker and shinier, she has gained some weight, and has and her energy level has increased.